If you are spotting bumps on your behind, you are not alone: Nearly 90 percent of women have cellulite. Cellulite generally occurs more in women than men due to the sensitive nature of their skin. Often, cellulite accumulates around the lower areas of the body, mostly on the front and back of thighs. Its presence can make you feel extremely self-conscious, especially in those situations that make you want to feel your best. It seems like nothing out there is making those lumps and dipples any smoother. Here, I’ve compiled a list of the best cellulite treatment options for you to try out. But before we delve into the options, it’s important you know exactly what you’re up against. This will give you better results at a faster rate. Cellulite is simply a term used to describe the appearance of bumpy looking fat cells on the body. It is not a disease or any form of infection. Sometimes, the fat cells can enlarge so much resulting in collagen fibers to bend causing the skin above to pucker. The body has three layers of fat, with cellulite building up in the layer closest to the skin. As you age, the skin thins, causing the presence of cellulite to be more visible. Cellulite can truly mess with your self-confidence. According to surveys, cellulite is the number one beauty bummer in women, well ahead of acne, wrinkles and frizzy. There is no permanent cure to cellulite; however, dermatologists believe you can camouflage the bumps and minimize existing ones tremendously. Here are some of the remedies that you can consider when trying to treat cellulite. Many of these creams are designed to dissolve the fat and smooth your skin. Others stimulate the circulation of the areas applied to release swelling toxins from the body. And some anti cellulite creams contain aminophylline, a prescription drug that is used in asthma treatment. These creams reduce cellulite by narrowing the blood vessels while forcing water from the skin. However, this could be dangerous to some people’s circulatory system. In addition, aminophylline can also trigger allergic reaction in some people. This surgical procedure is performed to rid the body of fat deposits. Liposuction, however, targets deep fat, not cellulite which lies just beneath the skin. However, the American Academy of Dermatology warns that liposuction may worsen the appearance of cellulite by creating depressions in the skin. Developed in Europe, this procedure was originally designed to relieve pains resulting from inflammatory conditions. It involves injection of substances like minerals, vitamins, enzymes and amino acids on the tissues beneath the skin. It removes cellulite by breaking down the fats. However, it comes with side effects such as infection, swelling as well as irregular contours. Massage and other spa treatments offer temporary relief to the skin’s dimpling appearance. 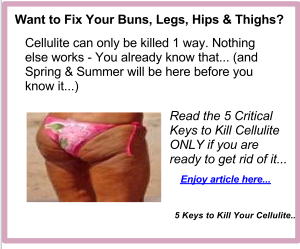 However, they may not get rid of cellulite completely. Any effect is short lived due to removal of excess fluid from the body. One of the most promising cellulite treatment options is laser and radiofrequency treatments. The first treatment stage utilizes combined negative tissue massage, infrared light and radio frequency to rid the body of cellulite. The second stage involves a combined tissue massage using diode laser energy. The third stage involves simultaneous use of radiofrequency at deep and superficial levels to rid the area of cellulite. All the three stages offer remedy to cellulite after a series of treatment with results lasting up to six months. Weight loss through regular exercise and healthy diet is without doubt the most effective cellulite treatment option. Shedding off the pounds and strengthening your leg, thigh, buttock and abdomen muscles can go a long way in improving the appearance of the dimpled skin. However, it is important to note that while the cellulite may be less noticeable after weight loss, it will not completely go away. It is important that you avoid toxins like excessive alcohol and cigarettes as these put a burden on your body’s lymphatic system. This is one of the most important things you can do to your health, and it will help rid your body of cellulite. In addition, you need to incorporate a lot of fruits and leafy greens in your diet. Also, include organic foods in your anti cellulite diet since they come with fewer toxins. Other foods that you need to exclude from your diet include junk foods, artificial flavors and colors, processed foods, diet soda, saturated fats, animal fats and butter. Salt and sugar limitations are also important as these aggravate fluid retention. Finally, hydrate your body and flush out toxins by taking a lot of water. Glucosamine supplements can help your body repair the dermis as well as the connective tissue. This is key to cellulite treatment. In addition, consider brushing your skin daily, especially before taking a bath. Brushing stimulates blood and lymph flow, removing dead skin cells while promoting new cell growth. Most Importantly. Finding What Works for You! 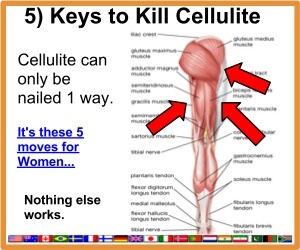 Cellulite can severely dent your esteem. However, once you learn the best cellulite treatment options, you will not have a hard time clearing your body of these bumps. Knowledge is power, and when you get an insight into the causes of cellulite, you can take measures to control future development.